An ISO 9001: 2008 Certified Company, “OPTIFLEX” specializes in quality Polycoated Tape Wrapped winding wires for submersible pump motors. A professionally managed business group, Optiflex has its corporate setup in Ahmedabad, Gujarat since 1979 and is engaged in the field of Wires & Cables and submersible pump-motors since Year 1991. With the changing scenario and market situation, majority of submersible pump manufacturers converted their design based on tape wrapped type of less O.D. winding wires in place of PVC winding wires. To cope up these requirements, we started a manufacturing unit for polycoated (Tape Wrapped) winding wires in 2003 with the production capacity of 20 Km./day, which is at present 200 Km./day. In January 2007, an installation of the latest copper drawing plant as a backward integration was incorporated to ensure the best quality copper and in-time deliveries to end clients, which of course is a major raw material of our product. Scaling the new heights in its business domain, the company launched PVC insulated 3 Core Flat Cables for Submersible Pumps and Electrical Wires for domestic wiring with the brand name “OPTICAB” in its newly constructed State-Of-Art plant spreader over 2450 sq.mtrs area and have more than 13000 sq. floor area & equipped with the latest, automized and highly sophisticated machineries and equipment. We are having ISO 9001:2008 certifications awarded by one of the most prestigious international standard accreditation body BUREAU VERITAS/UKAS for quality management system since Feb-2004. 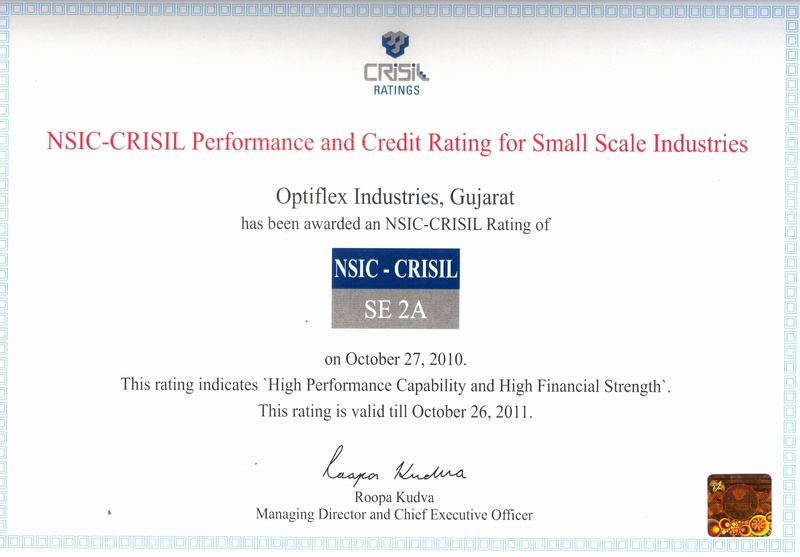 Our company has been awarded an NSIC-CRISIL Rating: SE 2A for High Performance Capability and High Financial Strength – which indicates the level of credit worthiness adjudge in relation to other SSIs – by India’s most reputed Ratings and Research Company CRISIL. OPTICAB Wires and Cables are available with mark and confirming to ISI 694: 1990 requirements. OPTICAB makes Wires and Cables, assessed with respect to the requirements for Low Voltage Directives on Electrical Safety and are certified for marking by one of the world’s leading certification body/registrar DET NORSKE VERITAS. Our focused future lies in Company’s today. Sound teamwork, organized infrastructure and go-getter attitude is the force which is deriving the company towards an ongoing process.